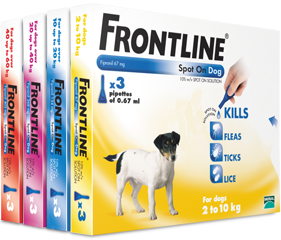 FRONTLINE® Spot On is an effective and easy-to-apply spot on product that, when applied monthly, helps to protect cats and dogs from fleas and ticks. It contains fipronil, which kills adult fleas within 24 hours of contact with your pet and adult ticks within 48 hours of contact with your pet. Plus it helps protect against reinfestation. Fleas Kills fleas within 24 hours of contact with the treated pet and prevents reinfestation. Help to protect the pet from fleas. Ticks Kills ticks within 48 hours of contact with the treated pet and prevents reinfestation. Help to prevent ticks from transmitting diseases. Use FRONTLINE Spot On monthly to kill fleas and ticks and provide continuous protection throughout the year. Select the correct size of pipette according to the animal's weight. There is no ﬂea product that can stop ﬂeas jumping on to pets. It is normal to see a few ﬂeas on the pet after treatment as new ﬂeas continue to hatch out from an infested environment. These ﬂea will be killed within 24 hours of jumping on to the treated pet. Each pet can act as a host for a flea infestation. FRONTLINE® Spot On doesn’t stop ticks attaching but kills them within 48 hours, helping to minimise the risk of tick-borne disease transmission. Treat all dogs and cats in the household with FRONTLINE® Spot On monthly for a minimum of three consecutive months to kill fleas. Frontline Homegard kills adult fleas and larvae and prevents eggs from htching. Remember to spray all areas where the pet goes. Larvae and pupae like dark areas so spray underneath furniture and into the cracks in flooring. Regularly vacuum carpets and furnishings and wash your pet's bedding at 60°C. This will help to reduce the number of eggs, larvae and pupae in the environment. Allow treated pets access to all areas to encourage fleas to hatch out of their pupae and jump on to the pet to be killed. Remember : It may take three months or more to get rid of flea infestation, as it can take this long for all the pupae to hatch out. the correct size of pipette is being selected according to the pet’s weight. To help you choose the right pack size we’ve produced this guide. Please be aware that this is just an aid to give you an estimate of your dog’s weight category and not all dogs fit with their breed average weights. If in doubt, weigh your dog and ask your FRONTLINE® supplier for advice. 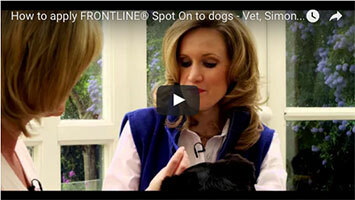 * Puppies must be at least eight weeks of age before they can be treated with FRONTLINE® Spot On . If selecting a pack size for your growing puppy, always make the selection according to their current weight. Always read the instructions on the pack carefully. If you can lift your dog without injuring yourself, then first weigh yourself on your bathroom scales, then tare (set to zero) the scales and stand on the scales holding your dog to work out dog weight; or weigh yourself holding your dog and subtract your own weight. Most vet practices and some pet shops have weigh scales and many will weigh your pet free of charge. Weigh your pet and choose the correct size pipette for their weight to ensure they receive the appropriate dose. Hold the pipette upright facing away from you and tap the neck to ensure the contents are in the main body of the pipette. Snap off the tip along the scored line. The place the tip of the pipette on the skin where indicated, and squeeze the pipette gently to empty the contents. For both cats and dogs: apply in two spots : one at the base of the skull and the second 2-3 cms further back. Part your pet's coat between the shoulder blades until you can see their skin. 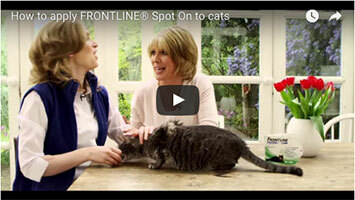 Applying FRONTLINE® Spot On causes fleas to become hyperactive and therefore more visible before dying. You can handle your pet as soon as the application site is dry. Your pet can swim or be bathed from 48 hours after application. For full instructions on the use of FRONTLINE® Spot On, please read the product packaging before use. Want to learn how to use and apply our product to your pets ? Advice Centre – just ask the experts. We can help!